...just a little something....: Happy with the Square Grid Cover-Up. The MFT New Release is Now Available! LOVE the square grid die, your cards are fabulous!! Awesome cards! Love the square grid! Love the Window with clouds! Cute cards. I had to put the grid/window card on my wish list..But I can see it is a great die to have in my stash. Love the use of the grid cover up! Your cards are gorgeous!! That last card with turquoise and black just stole my heart!! LOVE! Fun, fun cards! I love the first one that looks like a quilt! LOVE how you used the grid in your cards and the color combos are fabulous! Your cards are great! That grid die has got me thinking of so many wats to use it. Perfect!!! Thank you for the inspiration! Great cards. I love the way you used the grid. Great cards. I love the quilted style with the grid coverup and that fantastic window scene. Such beautiful creations for a fabulous MFT release! Can't wait to shop!! What awesome cards! Love the color combinations and the window grid. This entire release makes me "Happy!" do love the release...... great ideas here..... love the giveaway...... thank you for it. Awesome ideas! Love the release! Thanks for the giveaway! Happy about this release! Cute cards. I love the blue raspberry, too. Such a cheery, summery color! What an absolutely fun card! It is so cool and the color is perfect! Great use of the grid die on the 1st two cards. Super cards. Love the colors and dies. Love the way you used the grid. These are all wonderful! Love the square grid coverup! these are sweet cards, love the blue. great idea to layer two different cover-ups! Yeah! Just happy cards- great idea! Love your inlaid grid design! Great cards! I love the little window scene. So very sweet! Love that 'quilt'! Such yummy color combos! Love the design of your cards! Like how you combined the Cloud cover-up with the Square cover-up. love the cards! I agree with Lisa Page...love you used the cloud cover up die! Fabulous cards! The first card is my favorite, I love the stamped squares! I did a patchwork card once, with small squares and no Cover Ups... One of those projects I ended up hating, thinking "why on earth did I start this?" Love your cards, especially the peeking out the window card! Super nice cards, love the grid pattern die. Actually, I love everything MFT has come out with. Thanks for sharing. Great cards and I love the new dies. Amazing cards and love the quilt look and how you created this, especially with the wording as background! These are all fabulous but the BG scene is my fav, so creative and cute. 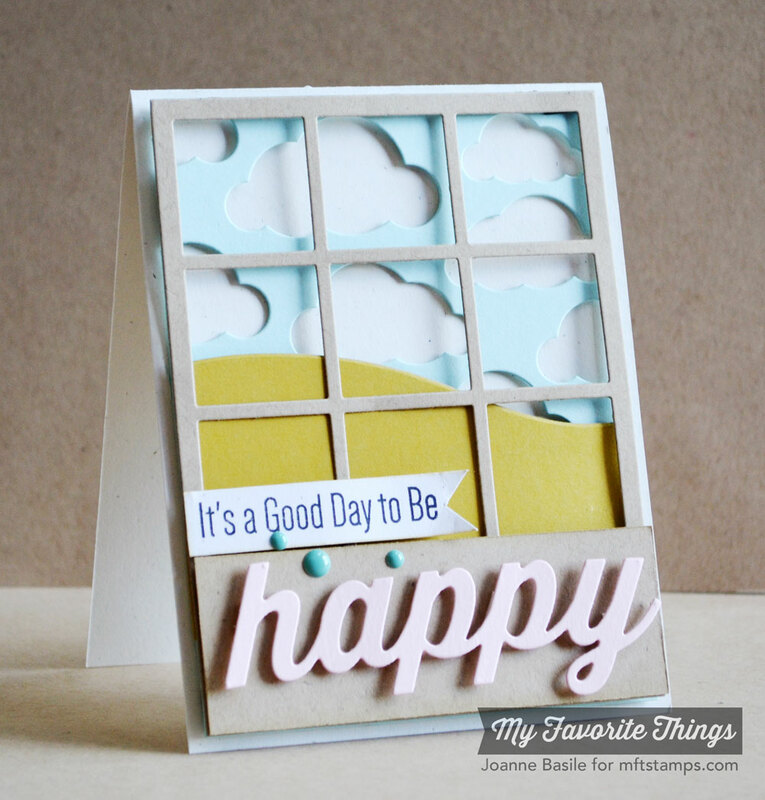 Love the way you stretched the die to create an inlaid diecut background AND a window!!! Love these awesomely cool cards and that Happy die-namics is a MUST HAVE!!! These are so great! I really love the window scene you created! Starting to really understand why MFT is a popular company. Really my style. Clean, crisp, easy, easily duplicated. Beautiful designs you've done here. Love the sky behind the window. So many different cuts that make a great card. Both cards are great. Love the inside too. I like your ideas! The grid background seems very versatile. The grid die is awesome! Love all your cards! What fun cards. Love that happy die. What nice color combos. Thanks so much. That happy die is so versatile, I really like it! Great colors and designs! Great cards... love the new grid cover plate! Great use of the grid! Great cards. Love the blu raspberry right now too. Just reminds me of blue summer skies. Thanks for sharing all of your great ideas! I love all of the birthday ones! Love how you've used the square panel die, great ideas, I especially love the one with the landscape background. These are all so fun! And so creative using the grid die in different ways. But the third card really caught my eye; beautiful! Love how you used the grid as a quilt! Can't wait to try it out as a baby quilt card, or a Get Well card! I love the patterned window scenes you created on these cards. 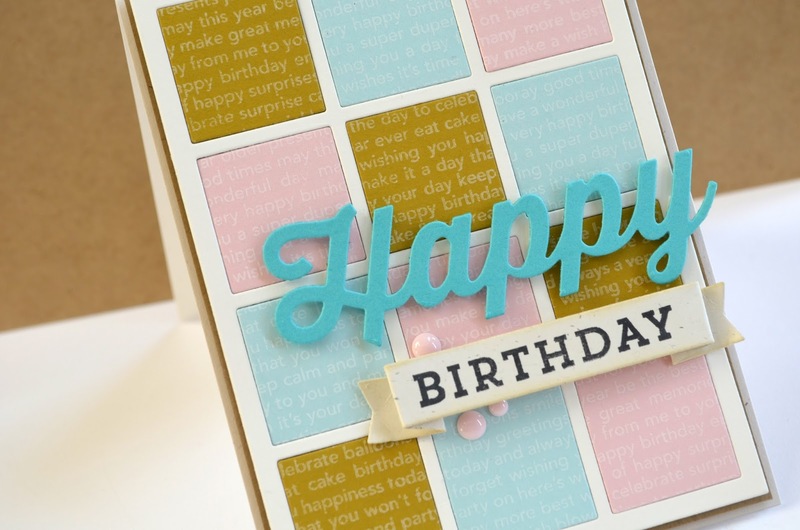 Thanks for the inspiration using the grid die, I especially like the first card, love the colors and design, fabulous job! This is Tesa Coo...Love the cubies and how you use this dienamics gives me inspiration. Very nice cards. Love the grid. ummmmm, like the squares and the window that they can make. Nice cards - so many awesome new products!!!! Love the squares of different papers! I love how you used the squares like a window! Very cute! I love your "quilt" background. It makes me happy, too! Love how you used the grid die!! Awesome cards. Love all your projects! Great colors and details. I just love how you layered the cover ups for through the window scene card! Awesome, Joanne! Wow... you made me sit up straight when I saw your first card using the GRID die--making it appear as an 'inchie' card. Love it. Great job on all 3. I have always liked cards with grid patterns. I know what you mean about the feeling you get when a card turns out just like you imagine. That's a big reason why we make them, right? L.o.v.e. that last card, so pretty and such beautiful colors! Love how you used the square grid! All these cards are terrific! Wonderful cards! Love how you used the Square Grid Cover Up 2 different ways.